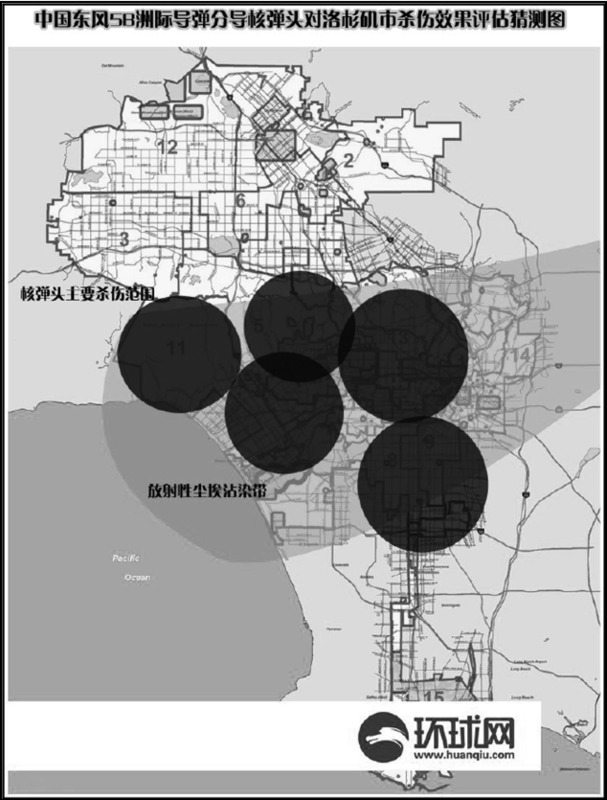 Screenshot/origin.www.uscc.govA map published by a state-sponsored Chinese newspaper showing a nuclear strike against Los Angeles. China has entertained the threat of nuclear strikes against west coast cities such as Los Angeles and Seattle, the annual 2014 congressional report from the US China Economic and Security Review Commission states. According to the report, a Chinese newspaper sponsored by the Communist Party ran an article in November 2013 about the possibilities of nuclear intercontinental ballistic missile (ICBM) strikes against much of the US’s Pacific coast. In the scenario imagined by the newspaper, China’s new JIN ballistic missile submarine could act as an ultimate deterrent to any hostile US foreign policy. [T]he 12 JL-2 nuclear missiles carried by one JIN nuclear submarine could cause the destruction of five million to 12 million people, forming a very clear deterrent effect. There is not a dense population in the United States’ midwest region, so to increase the destructive effect, the main soft targets for nuclear destruction in the United States will be the main cities on the west coast, such as Seattle, Los Angeles, San Francisco, and San Diego. However, threats from China today carry more weight than they did during the 1990s. According to an executive summary of the report, China’s nuclear ICBM stockpile capable of reaching the US will likely expand to over 100 missiles within the next 15 years. Simultaneously, China is developing a fleet of road-mobile ICBMs, the DF-41, that could be deployed as early as 2015. The DF-41 will be capable of carrying up to 10 missiles that would each have a maximum range of 7,456 miles. This range would allow China to target the entirety of the continental US. Tensions in Asia have been increasing as China attempts to flex its regional muscles. This growth has led to military standoffs between China and US allies Japan and the Philippines. In the event of a war between China and Japan, the US would be treaty-bound to come to Japan’s aid. However, any military aid could become severely limited by the possibility of a nuclear strike and the possibility of a new Cold War.